You could be forgiven for thinking that, if you haven’t seen the original Despicable Me (2010), the subtler nuances of the catchily entitled Despicable Me 2 might be lost on you. Well don’t worry, subtlety is not what this cartoon is aiming for. In fact the new animated feature by directors Pierre Coffin and Chris Renaud, starring the voice talents of Steve Carrell, Jason Segel and Russell Brand, makes little pretense at delicacy, going instead for a hyper slapstick, laced with nostalgic wit, which should appeal to younger and older audiences alike. Gru (Carrell), the evil supervillain, has put his old ways behind him and now devotes his life to looking after his three adopted daughters, whilst running a successful jam making business. However you can never get rid of the past completely, and when a secret Arctic laboratory is stolen, the AVL (Ant-Villain League) knows there’s only one man who can get to the bottom of the mystery. In the world of cinema there are two types on cartoon. Firstly there are those aimed purely at kids whose appeal, if honest, is likely to be somewhat limited. You then have those whose makers have learnt the secret of longevity for film animation – to make a movie which caters both to kids and the adults who will inevitably be forced to sit through it with them, for the umpteenth time on a rainy afternoon. Despicable Me 2 fortunately falls within the second category. Here is a film whose characters – such as the lovable yellow creatures simply referred to throughout as ‘Minions’, and Gru’s adopted daughters Margo (Miranda Cosgrove), Agnes (Elsie Fisher) and Edith (Dana Gaier) – will appeal to kids, as they face endless crazy situations as well as the pitfalls of growing up such as first dates and overprotective fathers. For adult viewers writers Cinco Paul and Ken Daurio have created a pastiche of James Bond from his Roger Moore heyday, with nods towards Scaramanga’s airborne car in The Man with the Golden Gun (1974) to the underwater Lotus from The Spy Who Loved Me (1977), as well as the inevitability of two secret agents falling in love before the film’s closing credits. 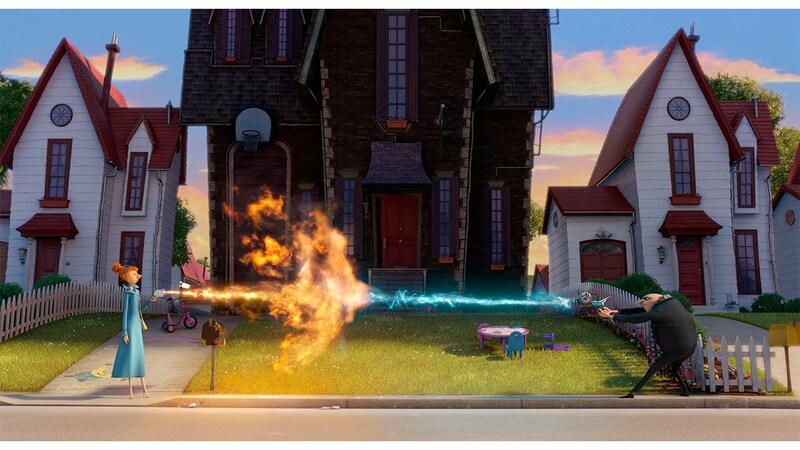 The unashamed candor with which the archetypal super-spy is referenced simply lends Despicable Me 2’s characters, and the film as a whole, a sense of reality which lifts it above the usual cartoon tomfoolery. Talking of credits, watch to the end as a trio of the ‘Minions’ appear for their very own mini production. I’m sure I’m not the only one hoping it won’t be long before these little fellas are given a film of their own.